If you follow this blog with any regularity, you might have noticed that I rarely, if ever, post photos of food. I guess it’s just not my thing, because I don’t know how to make food tell a story or convey an emotion. Certainly it can be done, but it’s not exactly what you would call my forte. 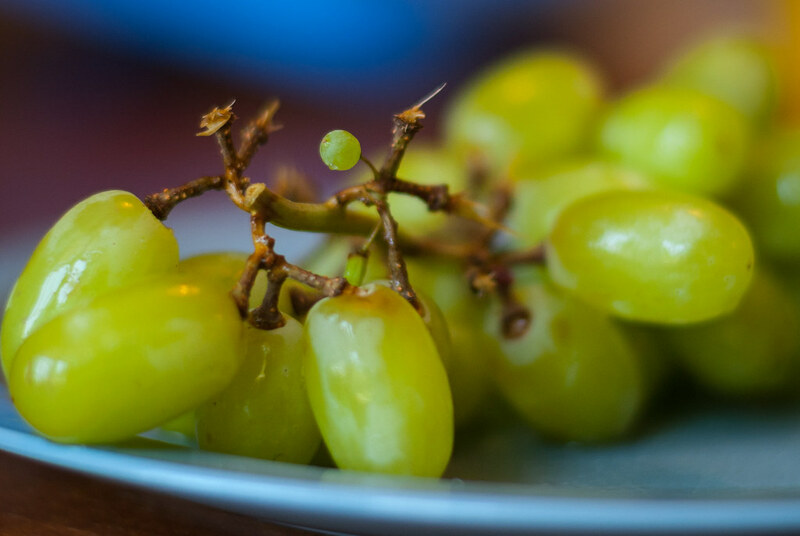 But when I was eating lunch with my son the other day we saw this tiny little grape amid a cluster of its normal-sized counterparts, so I thought I might as well bust out the ol’ D200 and 50mm lens and see what I could do. I tried to pay attention to lighting and background, which meant I had to scoot the plate over a few feet to get the light from the window, and angle my shot in such a way as to isolate the small grape from the rest but also put it in front of a section of background that would make it stand out. I also had to use a few of the focusing tricks I learned on my July 23 photo because the 50mm 1.8G is no substitute for a true Macro lens. I’m pleased with the results, but even though I had fun attempting this shoot but I don’t think I’ll be tossing up shots of my lunch on Instagram anytime soon. Nothing more fruity than a green grape. Nice shot of the Little Green Grape who . . . OMG! Don’t tell me you or your son ate the little guy, did you?